The goal of the event was to create awareness to the problem of child homelessness. The WTHS Student Council members and their chaperones pose for a group photo during their “Sleep Away” night on campus. 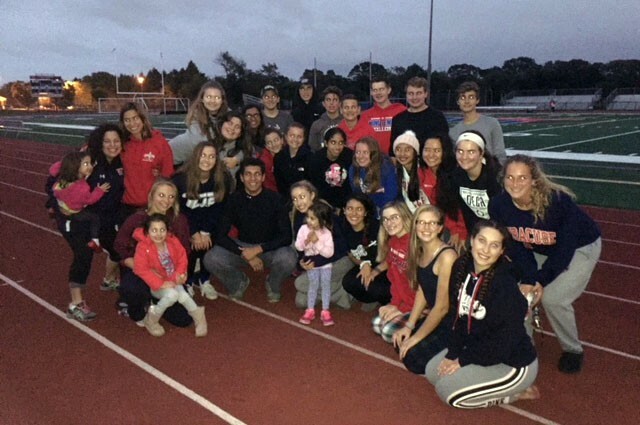 Three-dozen members of the Washington Township High School Student Council did their part to raise awareness — and funds — for homeless children during their inaugural “Sleep Away” event on Friday, Oct. 13. The 36 students pitched tents adjacent to the varsity soccer field and spent the night outdoors in the rain and fall-like chill. From 5 p.m. until midnight, the students accepted donations for the WTHS Pantry — for students in need at the high school — and for Covenant House, a national organization that assists homeless youths. More than $1,500 was collected, as well as items such as toiletries, water bottles, non-perishable food, granola bars, cereal, snacks and pasta, as well as clothing including socks, gloves, hats and T-shirts. The goal of the event was to create awareness to the problem of child homelessness. More than 2,000 children were reported homeless in New Jersey alone in 2016. During their stay on the field, the students showed off their Spirit Week dance moves, enjoyed pizza, tossed a football and told scary stories. Student Council advisors Shannon Molloy and Brittany Mason oversaw the event.